Ever wished there was a better way to share music with your friends? 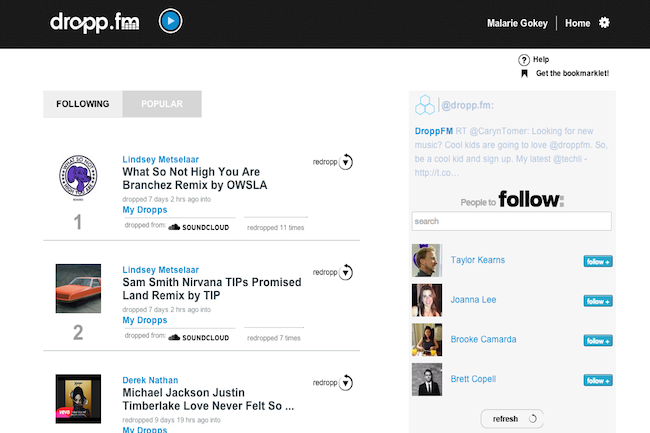 A NYC startup called Dropp.fm aims to create a new social network for people who love music. Imagine a newsfeed filled with audio tracks recommended and shared by your friends. As you scroll through your friends’ music choices, you can listen to a playlist either you or your friends have created. If you like a song someone has shared, you can share it on your profile, too. That, in a nutshell, is Dropp.fm. The project is still in its earliest phases, but Dropp.fm’s founder Parker Lieberman is confident that it will change the way we interact with music on the web. Lieberman is a longtime music enthusiast with a fondness for producing and sharing music that he likes with his friends. Even though there are tons of music streaming websites and apps out there, Lieberman thinks that they just aren’t social enough. SoundCloud has come the closest to achieving what Dropp.fm seeks to do. SoundCloud gives users access to new and pre-release tracks, which they can then share, like, download, or add to a playlist. Still, it isn’t everything Lieberman wants it to be. Fed up with sending his friends countless emails filled with YouTube and SoundCloud links, Lieberman set out to make his own music-based social network. While he was formulating the idea, he took a look at several different streaming and music sharing services that are already available. “Here’s what’s out there. Here’s how they are doing it, and here’s how I want to do it,” Lieberman told Digital Trends. Once he had the general idea of what he wanted, Lieberman enlisted a bunch of his friends to test out the service. To access Dropp.fm, you just head on over to the webpage, sign in with Facebook, and go from there. New users will be greeted with suggestions of who to follow and a stream of what’s popular. Currently, only YouTube and SoundCloud links can be “dropped” into your profile’s feed, but Lieberman hopes to add other media sharing sites like Vimeo in the future. If you like one of your friend’s songs, you can “redropp” it into your personal feed. The site also lets you create custom playlists. When you click play on one of the dropped links, the song starts to play. If it’s a YouTube video, a small section at the top right of the screen will show the video. Right now, Dropp.fm doesn’t let users comment on friends’ dropps or simply “like” them, but Lieberman says these added functionalities are still in the works. He is also currently working on a mobile app, though no release date is set yet. Other new features will be added as users start to request them.